Here is another Whiff of Joy preview of the new Party Animals (designed by Alison Acton) which will be released on January 3rd. I thought I would combine my preview with a sketch challenge for you and even offer the cute little mouse as a prize for one lucky crafter. Maybe you'll find the time to create a card using my sketch below. Just post it on your blog and leave the direct link as a comment under this post. 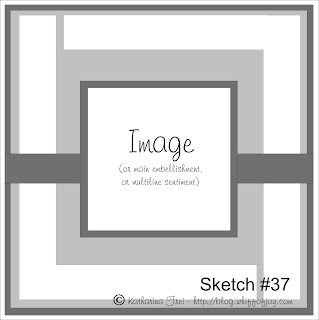 The sketch challenge is open until January 4th. Hier ist eine neue Whiff of Joy Vorschau auf die neuen Party Tiere (designed von Alison Acton), die ab 3. Jänner erhältlich sein werden. Ich dachte mir, ich vereine meine Vorschau gleich mit einer Sketch Challenge bei der ihr die süße Maus gewinnen könnt. Vielleicht habt ihr ja Zeit und Lust eine Karte nach meinem Sketch zu basteln. Dann veröffentlicht sie einfach auf eurem Blog und hinterlaßt mir den direkten Link als Kommentar unter diesem Beitrag. Die Challenge läuft bis zum 4. Jänner. I used a large corner stamp from an Inque Boutique set (French Quarter), stamped it with Versamark ink directly onto the patterned paper from gcd and heat embossed it with white embossing powder from Rayher. Ich habe einen großen Eckenstempel von Inques Boutique (French Quarter) mit Versamark direkt auf das Motivpapier von gcd gestempelt und mit weissem Puder von Rayher embosst. I used Spellbinder's Nestabilities Labels 1 to cut out the mouse and matted it on SU's kraft cardstock. 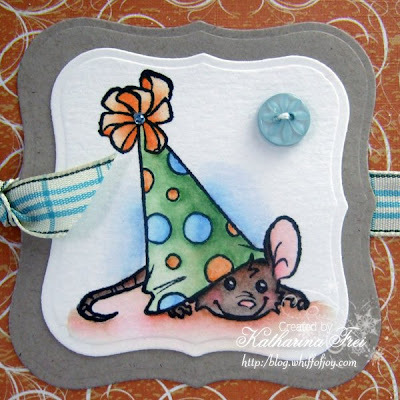 Ich habe Spellbinder's Nestabilities Labels 1 verwendet um die Maus auszuschneiden und sie dann auf Kraft cardstock von Stampin' up gemattet. Looking forward to seeing your creations with the sketch!! Ich freue mich schon auf eure Werke für die Sketch Challenge!! oh that mouse is just so cute!! and the sketch is great - I'm trying to shake off a dreadful headache so I don't know whether my brain will work well enough to tackle the challenge but I'll give it a go. OH MY! ok, today is my first day back from the holiday to the blogging world... and what do I find!!! I am dying here!!!! (I saw Bev's post with her sneak peek!!!!!!!!!!!!!!!!!!!) Ok so I will be at the whiff of joy site on the 3rd ready to hit purchase as soon as the button will allow! Love all the sneaks I have seen, and your mouse card is just adorable... but I think you know which image will be my favorite!!!! He is adorable, Katharina!! I can't wait to see all of the release! I love her illustrations! Gorgeous card. Love the image it's sooo cute and the colouring is fantastic. Many thanks for the chance to win this. I've put my card on my blog here if you want to have a look. Hope you have a fantastic 2009. Die WoJ Stempel sind einfach nur super schön, nur leider besitze ich noch keinen, was sich aber hoffentlich bald ändert! Bin schon ganz gespannt auf die neuen Motive!! Wünsche einen guten Rutsch ins Jahr 2009!!! HI Katharina!! Super adorable mouse!!! FUn sketch too!! Here's my take on it! Happy New year, can't wait for the 3rd!! Great sketch Katarina, gave me an excuse to stamp! LOVE your new little critters too, adorable! Ist die Maus goldig!!!! Und ich hab auch schon das ein oder andere neue Motiv auf den Seiten der DT-Mitglieder entdeckt. Eins schöner als das andere!!!! Hier ist mein kleines Werk. Übrigens ist der Adventskalender-Stempel sehr gut angekommen und auch schon im Einsatz*g.
Thanks for the fun Sketch and a chance to win that cute little guy! Oh I really love these stamps. This little mouse is just too cute! Love the card you've created and I love the sketch too, HERE is my take on the sketch. Gosh such a cute mouse!!! Just love it!! 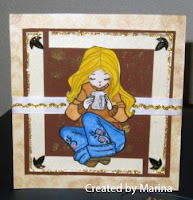 I have made a card for this challange, but I don't have ANY WoJ stamps so I used a Magnolia..
Hab mich auch mal frisch ans Werk gemacht und nach Deinem tollen Sketch eine Karte gewerkelt. What a cute card Katarina. Thanks for a great sketch - Here is my card. Can't wait to see all the new releases! Awww...Katharina, this your card is just so lovely! I love this sneak peek and others that I have seen! I have a fondness for little mice images! Congratulations on another stunning collection. Thanks for the great sketch. You can see my card here! Hugs and Best Wishes for a wonderful 2009! Many thanks for the chance to win this. Die Party-Animals sind soooo süß und ich bin schon ganz gespannt auf die anderen Tierchen! Deine Werke gefallen mir immer noch supergut! Ich wünsche Dir einen guten Rutsch ins neue Jahr und alles Gute für 2009!!! A great sketch to work with too, enjoyed it very much thankyou..
oh what a cutie I love this little mouse, love the papers I dont know whether my card qualifies for the sketch as I haven't done this before this is my first time. I have upload my card on to my blog http://tracy-addiction.blogspot.com/ hope this right! Your card is so beautiful Katharina! I love the cute little mouse. Hier ist mein Beitrag schöner Sketch Dir und Deiner Familie einen Guten Rutsch!!! Freue mich schon auf die neue Collection! Ooo, what an adorable party mouse! Enjoyed working with this sketch, thanks for the inspiration! Das Mäuschen ist so süß. Hier ist meine Karte nach Deinem Sketch. Ich wünsche Dir und Deinen Lieben ein *Frohes neues Jahr* und alles Liebe und Gute für 2009! meine Karte zu deinem tollen Sketch. Die Karte ist supersüß und der Sketch einfach wunderschön. Such a cute image and a gorgeous card. I have had a go at your fab sketch and you can find my results here. Hope you like them, and Happy New Year. First of all: best wishes for 2009 for you and your family! Second: I love this sketch! Wonderful sketch - great to work with and I'm loving the look of the new stamps. He is adorable! I can't wait to see the rest of the line tonight at the preview! Here's mine! Ok my link didn't work...let's try this again. Gorgeous card, Katharina, I love your fabulous colouring. This is an adorable stamp. I adore this cute little mouse. So sweet. :) Here is my card I hope you like it. I finally got the time to make a card with the sketch. Couldn't miss it, since it's a beautiful sketch! Love the new stamps can't wait to buy them. Lovely mouse :) I can't wait to see all of the release! Phew just made it - I hope. Missed the party the other night but at least I've found time for this challenge. Wonderfull sketch and great stamps!! Thanks for a chance at the adorable mouse!!! Die maus ist wirklich zuckersüss, ich würde mich riesig freuen, wenn ich sie gewinnen würde. 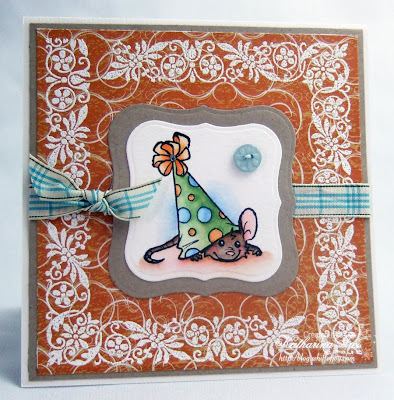 And boy, do I love that mouse :)), he is so cute.I love your new release of stamps.